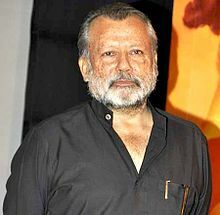 Pankaj Kapur (born 29 May 1954) is an Indian theatre, television and film actor. He is the father of actor Shahid Kapoor with his first wife, Neelima Azeem. He has appeared in several television serials and films. His most acclaimed film roles to date have been that of Inspector P.K. in Raakh (1989), Dr. Dipankar Roy in Ek Doctor Ki Maut (1991) and Abba ji, (based on Shakespeare's King Duncan) in Vishal Bhardwaj's adaptation of Macbeth; Maqbool (2003), all three roles which got him National Film Awards. In the 1980s, he became a household name through the TV series Karamchand, a comedy television series in the detective genre. And in the millennium, Office Office, a comic satire on prevalent corruption in India. After graduating from National School of Drama, he did theatre for next four years, until he was offered a role in Gandhi by Richard Attenborough. Over the years, as a director, he has done over 74 plays and serials, including Mohandas B.A.L.L.B., Wah Bhai Wah, Sahabji Biwiji Ghulamji and Drishtanth, Kanak Di Balli, Albert's Bridge and Panchvan Savaar. He made his film debut with Shyam Benegal's film Arohan (1982). Following that he played the role of Mahatma Gandhi's second secretary, Pyarelal, in the Richard Attenborough film Gandhi in 1982. Later he dubbed for Ben Kingsley in the Hindi version of the film. Thereafter he appeared in a string of art films that came under the parallel cinema category, with leading art films directors, starting with Shyam Benegal's Mandi (1983), Kundan Shah's comedy Jaane Bhi Do Yaaro again in 1983. This was followed by Saeed Akhtar Mirza satirical Mohan Joshi Hazir Ho! (1984), Mrinal Sen's Khandhar (1984), and Vidhu Vinod Chopra's suspense thriller Khamosh in 1985. He appeared in many art films, many of which went on to win National Film Awards. In 1986, he switched to television, with the role of Karamchand jasoos(detective) in the detective-comedy, Karamchand, also starring Sushmita Mukherjee. Over the years he has been seen in numerous TV serials, including, Kab Tak Pukaroon (Doordarshan) Zabaan Sambhaal Ke (a remake of the English TV series, Mind Your Language), Lifeline with Vijaya Mehta, Neem ka Ped and finally comic interludes in Philips Top 10. Meanwhile, his tryst with art cinema continued, as he starred in films like Chameli Ki Shaadi (1986), Ek Ruka Hua Faisla (1986), and Yeh Woh Manzil To Nahin (1987). In 1987, his comic side was visible again in the commercial action film Jalwa, also starring Naseeruddin Shah. His first National Film Award came with the 1989 film, Raakh, which also starred Aamir Khan. His strongest performance in the early part of his career came from his lead role of struggling scientist in the film Ek Doctor Ki Maut (1991), for which he was awarded the 1991 National Film Award – Special Jury Award. In 2000 he returned to television with the serial Office Office a satirical take on the prevalent corruption in India. In 2003 he appeared in Maqbool, Vishal Bhardwaj's adaptation of Shakespeare's Macbeth. His antagonistic performance as the short-statured, potbellied, shuffle-footed Abbaji in Maqbool got him the 2004 National Film Award for Best Supporting Actor. Meanwhile, he released films like The Blue Umbrella (2005), Dus (2005) and Halla Bol (2007). In 2006, he started to be seen again on TV. In the TV series, Naya Office Office, a sequel to his previous series Office Office. On 11 January 2013, the Vishal Bharadwaj-directed film Matru Ki Bijlee Ka Mandola, starring Kapur was released. 1986 Chameli Ki Shaadi Kallumal "Koylawala"
^ a b "Punjab is a land of great writers and actors, says Pankaj Kapur". hindustantimes.com/. 2017-12-02. Retrieved 2017-12-30. ^ a b "Screen Videocon Film Awards Winners". Screen. Archived from the original on 20 October 2002. Retrieved 13 November 2018.